Noel is suspicious of the Pats, Commander Hilltop and Jim Carter who are acting very suspicious trying to explain that Keiichiro is taking a day off for a trip instead of telling him about the real mission. Noel decides to tell the Lups about his suspicions and has Kairi follow Keiichiro on the trip. Keiichirio is surprised when Kairi spots him at the train station and proposes they go sightseeing together. They first have lunch, play games and then have some treats. On their way to the hot springs, Keiichiro spots a young girl crying. 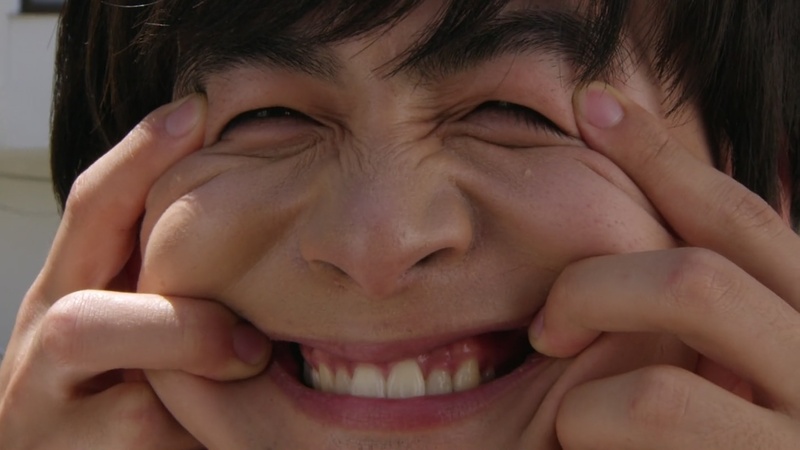 He comes across as too intimidating so Kairi comes over to squeeze his face which makes Keiichiro look like an even bigger weirdo. Keiichiro and Kairi’s bickering is what gets the girl to eventually laugh. They bring her to the police station. Keiichiro tells the officer that the girl left her hotel alone to look for a hair tie she dropped and then she got lost. Keiichiro decides to go look for the hair tie and tells Kairi he doesn’t have to come with. That triggers a memory for him. While Keiichiro frantically looks for the hair tie, Kairi goes to buy a new pair. He heads back to the station where the girl’s parents have come to pick her up. Kairi is about to hand the girl the new hair tie, but Keiichiro comes running with the actual hair tie the girl lost. The girl is so excited and thanks Keiichiro for finding it. Kairi clutches the new hair tie, seemingly upset. Down in the underworld, Goche is horrified that Gangler Kunks is out on the prowl. Dogranio says he gave him an appropriate Collection Piece so it’ll be interesting to see how it turns out. Jim Carter shows the Pats video of Kunks just creeping around on rooftops across the city. Noel suggests they call Keiichiro, but the Pats again act overly obvious about not wanting to disturb him. 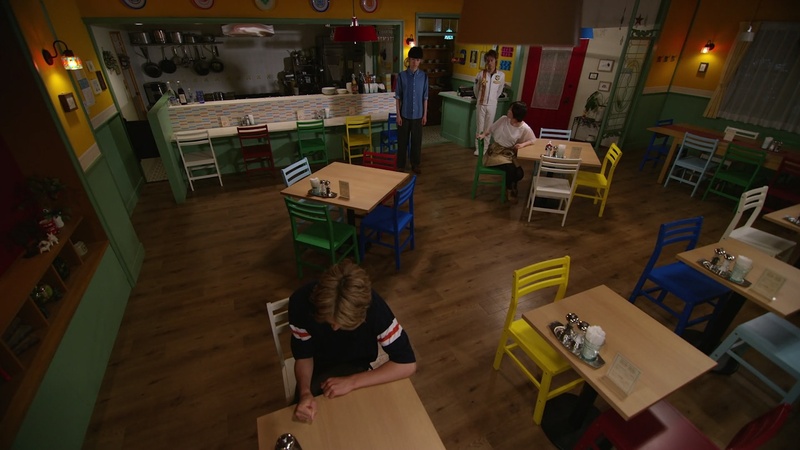 Back to the two Reds, Keiichiro senses something is off with Kairi and asks what’s wrong. Kairi tells him about his older brother taking time out from their trip together when he was a kid to help a lost little girl. Kairi had felt very jealous and selfish. He admits that unlike his older brother, he’s a bad person. Keiichiro says that’s not true since Kairi helped him back there with the little girl earlier too. Kairi remembers being sad to his brother who cheered him up by saying he was still helpful for waiting. Keiichiro gets a text from the person he is scheduled to meet. He tells Kairi he has to go and he runs off. Keiichiro meets with some sketchy looking people who have a VS Vehicle they hope to exchange for money. Keiichiro shows them his bag full of cash, but the gangsters have no intention of handing it over. Instead, they will keep the VS Vehicle, take the cash and kill Keiichiro. Keiichiro manages to take on the six goons by himself and even trips the boss. Keiichiro reveals he is GSPO and that local cops tipped them off about continued black market art dealings. Keiichiro lets HQ know he has retrieved the VS Vehicle. Kairi decides to swipe it for himself. Keiichiro and Kairi both morph and they battle for the Piece. But Kairi seems to hesitate somewhat against Keiichiro. 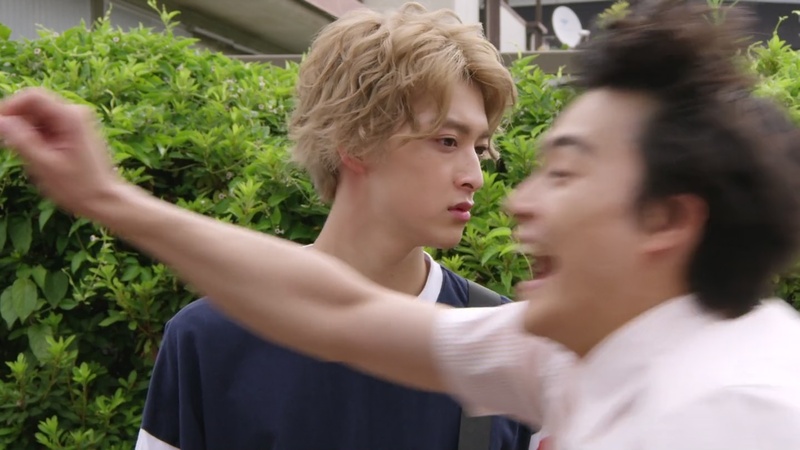 Keiichiro notices Kairi isn’t putting up much of a fight. Meanwhile, the others are facing off against Kunks whose power is to spray farts. The Collection Piece he had masked the smell. Dogranio tells Goche to go embiggen him already. Kunks lights all the farts he spread around the city and the city explodes into a sea of flames. Noel says they need the Splash VS Vehicle. Conveniently enough that’s the Piece Keiichiro was supposed to retrieve from the mobsters. Tsukasa calls to tell him. Keiichiro thinks about it and decides to tell Kairi to hurry over with the VS Vehicle to help put out the fires. Kairi doesn’t understand. 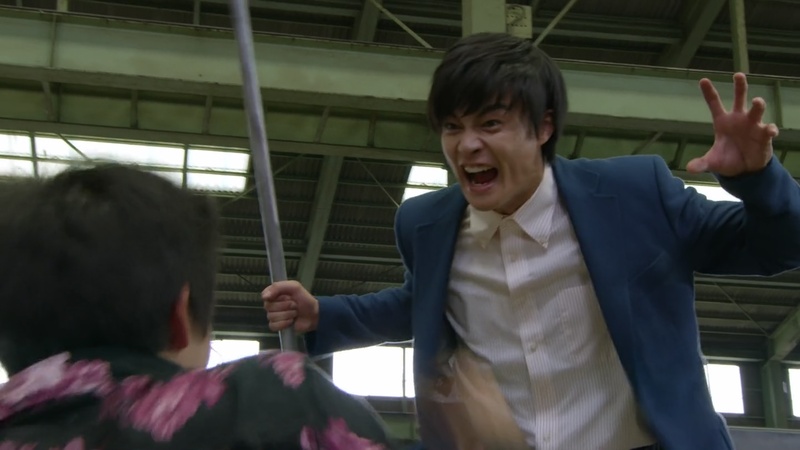 Keiichiro screams at him to go. Kairi joins the others and with Good Striker they form LupinKaiser Splash Magic. They put out the fires. Good Striker asks where Kairi could have found the VS Vehicle Arsene Lupin gave to girl he fancied. Umika and Tooma are surprised when Kairi says the cops gave it to him. With Noel’s help, they finish off Kunks for good. Back at the GSPO, Keiichiro apologizes for letting the Lups get the VS Vehicle, But Commander Hilltop says it’s alright since they were able to keep the death and destruction low. Jim Carter says he’s surprised the Red kaitou listened to Keiichiro’s request. But Keiichiro says he wasn’t surprised at all. 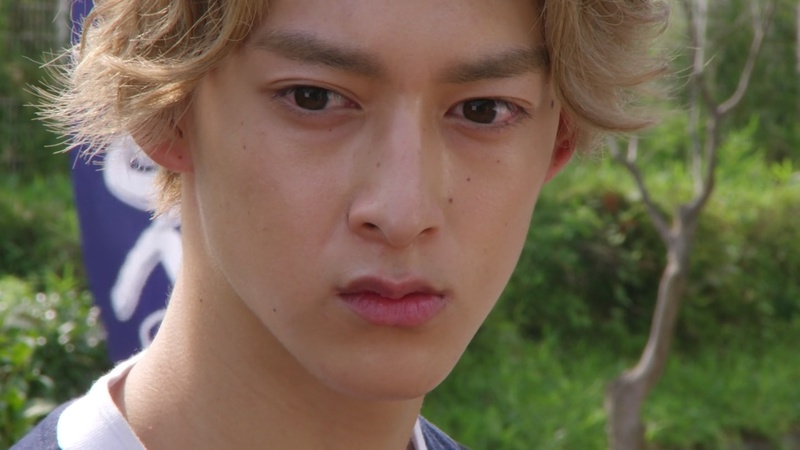 Over at Jurer, Kairi is still moody as he thinks about his day with Keiichiro compared to his older brother. Well, I’ll just say right now that fart jokes are never a good thing. It’s 2018, for goodness sakes. Thankfully, the rest of the episode was okay, otherwise this would’ve been a complete waste of time. I definitely prefer this emo, moody and broody Kairi over the smartass, cocky Kairi. Definitely more interesting. I will say that it is also refreshing that we have an oniichan/aniki problem instead of a daddy problem this time. Keiichiro trusting Kairi as opposed to his incessant screaming at wanting to catch him was nice. If this were a different show, I’d think that Keiichiro is starting to put two and two together about the Lups’ identities. But of course that’s not the case. So basically it’s the Pats continuing to warm up to the kaitous while the Lups continue to screw them over for their own personal reasons. Oh well. The Pats acting so obvious was very strange. Either the show really is going all in with trying to make them as goofy and as much of a bunch of bumbling idiots as possible. Or they intentionally were trying to set up Noel. With the way the show has been in the previous 29 episodes, I’ll go with the former. They really just wanted to paint the Patrangers as complete idiots compared to the awesome, invincible Lupinrangers. So, apparently Umika’s distaste of Keiichiro stems from her attempts to play matchmaker for him and Mina from all those episodes ago. I remember it being very obvious that Keiichiro did have feelings for Mina and Mina understood that as well. The episode ended with the mutual understanding that they’d pursue a relationship when it was the right time. Umika was just being a naïve teenage girl not understanding all of that. Anyway, overall this was a better episode than recently. I do hope we get more into deeper character stuff than the usual that we’ve been getting. Come on, this is a truly good episode. 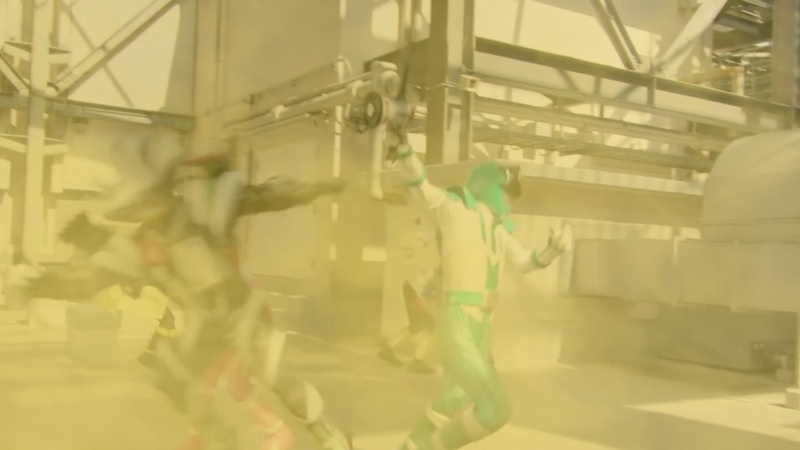 Keiichiro being more empathetic and putting aside his pride by handing the splash to Kairi and he feeling bad about it was good stuff and that´s what make the patrangers a real sentai. I honestly felt a lot more after the goofier Tooma-Sakuya episode. Like, I get what this episode was trying to do with Keiichiro and Kairi, but I don’t think it hit every target for it to be the most effective. Hopefully this is just the start and the show finally gets moving with the main story and conflict. Having the back and forth still at Episode 30 is already too long. Let me say this to start. Initially, I am a neutral fan, which support both sides. However, after episode 11, I give full dedication to support Pats more than Lupins. 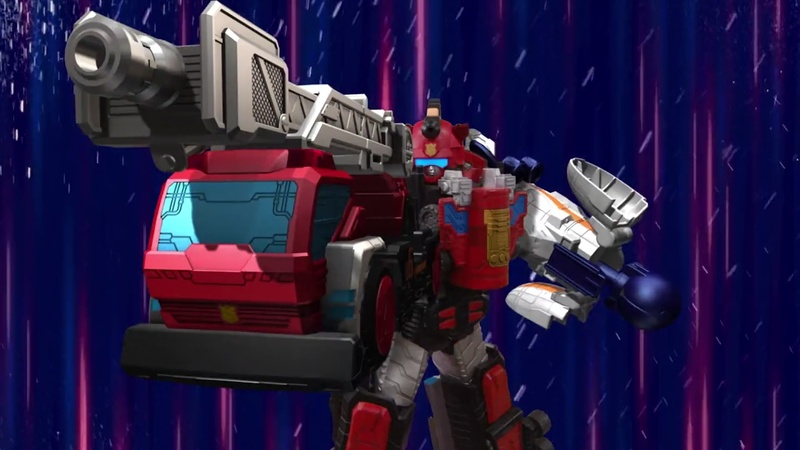 This episode honestly had potential for Pats to shine in getting a new VS Vehicle. However, everything goes to waste because the writers had to change the story to be biased for Lupins due to various circumstances in Toei internal affairs we truly don’t know . Some speculate that it’s mainly because the Trigger Machine toys aren’t selling well even with discounts, among children in Japan compared to dial fighters. And as you said, they made these professionally trained elite officers look like total idiots and they made a complete fool of themselves over something simple. 1. It is when Kei-chan and Kairi help a lost little girl. Kei-chan’s natural face is quite scary despite he was being nice and help people. However, Kairi lightens up the situation by making a fool out of Kei-chan’s face, by saying that this Onii-san isn’t scary and then realised that he was wrong and scared too. Not to mention too where Kei-chan goes out searching every corner of the town, looking for a simple hair tie while Kairi decides buying a new one would solve the situation. It may be hurting for Kairi but I appreciate his feelings to help other by coming up with a solution he can do. Here’s the point that I think they both are good at. Kairi is good at communicating with children that they are willing to tell their problem to him while Kei-chan had the skills and dedication at solving the problem that the children had in the most effective way. It just reminded me of Hidari Shoutarou and Philip/Sonozaki Raito from Kamen Rider W. The two of them are a two in a one detective and Kamen Rider. Shoutarou gathers information and important keywords while Philip enters those keywords in his Planetary Bookshelves (Gaia Library) to know the criminals’ name, Gaia Memories, their next target, hiding location and etc. 2. Kei-chan at meeting the underground dealers. They made him looked awesome, handling six human opponents who had robbed over many, and managed to achieve two birds in one stone. The first one is getting the new VS Vehicle without giving away any money and second is beating and capturing those dealers. 3. Kei-chan in fighting Lupin Red the second time. In Episode 5, Kei-chan said something that really drove Kairi mad and hurt his feelings. The results is that Lupin Red gets away with Cyclone and Biker. This episode shares that kind of theme from that episode. Except this time, Kei-chan improves significantly that he made Lupin Red being on the defensive, which was the opposite then what happened in episode 5. Provided that the Ganglar this week is still capable for the rest to handle without Trigger Machine Splash, I’m pretty sure Kei-chan can get back Splash from Lupin Red with his own two hands. The outcome of this episode is what rather made me not to watch Lupin VS Pat for three week straights. First, because it betrays my expectation that LupinKaiser Splash Magic wasn’t made with Kei-chan and Lupin Red working together in one cockpit. I mean, Magic was simply granted to Lupins by Noel for free and no effort so why is it that Lupins get away with Splash that comes from someone else hard work? In this case it is the police and Kei-chan. How come someone who do nothing gets reward while the ones who did the hard, danger work and had to sacrifice their gets nothing? That’s what I’m rather not satisfied with the writers doing this kind of thing for this episode. The Pats get Crane and Drill in episode 14 on their own merits in a situation that really deserves them to have them. This is acceptable because not to mention that they fell for a Ganglar trap that may causes Kei-chan to stuck deep underground, the rest nearly died because the boss, Dogranio was furious and disappointed with Togeno’s performance attack everyone on the ground to show this. If they really did what happened in episode 30 for this, I’m sure to stop watching until the next series come in. While I’m happy that Kairi didn’t get cocky on managing to get away with another VS Vehicle, I seriously hoped for a better way this episode can be displayed. And hypothetically if I’m the one in charge in this, I could suggest some improvements, especially the reason that they gave for Kei-chan to go on vacation. Before I explain further, I had something to share regarding when people go to work. In Human Resources Department regardless of any company (especially for big ones), workers can take leave but they have to fill the leave form (annual/sick and etc) with reasons and get approval from their supervisor . HR department are fine as long as the supervisor approves it. I know this may not be appropriate with the context in this episode but I had to say it, maybe I missed the hint of it somewhere. a. He feels homesick and wants to see his family after being away from home for more than a few months . He cannot proceed doing work like he always did because of this. b. His parents, maybe his mother who is a hot-headed nagger type was whining that she missed him. She wants to see her beloved son and that calling him daily is not enough. To prove that, they can tell that in a flashback, Kei-chan was doing work as usual until he receive a phone call from his mother, who yelled so loud that even his co-workers, Sakuya, Tsukasa, Noel, Jim and supervisor Hilltop can hear it, which made Kei-chan embarrassed and had to go for the sake of his family. c. On one of the days that he want to take leave, that is a special day to him. Maybe that day is the anniversary of his grandmother or grandfather or any of his closely bonded relatives pass away and he wants to pay a visit to their graves if possible. Or if they are gathering for some family celebration but the anniversary of someone that passed away is more common. While a and b looks similar, the difference is on whose POV that makes Kei-chan takes annual leave. Personally, a would be my primary reason to take annual leaves, since by coincidence that my place for internship is quite far from hometown so I cannot return very often. Since a Ganglar also appeared in the episode, Tsukasa and the others can tell Noel this when he wants to request help from Kei-chan. They want Kei-chan to enjoy his vacation with his family as much as possible because he may not get another chance to do so. If Kei-chan was summoned to return, his annual leaves will be considered void. They have to work harder for Kei-chan’s part if they want their fellow members to be happy, and they only called Kei-chan if the situation was too much even for just themselves to handle. I mean, that way, even Noel would actually pondered and considered of letting the Pats off the hook since he can’t really steal other people’s precious time with their love ones for his own personal goals. That is all I think for just this episode. Thank you. You make excellent points. My biggest problem with the season is that it’s supposed to be a VS season, yet it is very obvious that one team is more important and the “stars” over the other team. Instead of the two teams being equal and the show working towards them eventually teaming up and working together. Instead of both teams helping to build each other’s characters up, it seems only the Pats are being used to help make the Lups look good. Just like how you mentioned about Keiichiro’s plan to take leave being too suspicious to Noel. The show made the Pats look so obvious like they don’t know how to be secretive and how to be good police officers. That’s what I’ve been most annoyed with. Sometimes they are very good officers, sometimes they look like they don’t know anything.